1. To many, the wolf has become a symbol of environmental integrity and North America's disappearing wilderness. 3. In extreme cold, a wolf can reduce the flow of blood near it's skin in order to conserve body heat. 4. 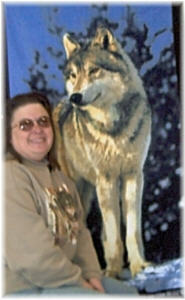 Favorite menu items for wolves include several large animals: moose, deer, elk, caribou and musk oxen. Wolves also eat smaller animals, such as beavers, rabbits, hares, voles, fish, muskrats, lemmings, raccoons, shrews, marmots, woodchucks, shellfish, ground squirrels, mice and birds. 6. Wolves have 42 teeth set in a strong jaw. The small incisors are used for nibbling and cleaning meat from bones. Canine teeth, which are more than an inch long are designed to capture and hold prey and to tear food apart. 7. Two things are essential for a good den: nearby water in the form of a stream, river or lake and a high or otherwise protected location. 8. The battle between man and wolf probably began over livestock as many as 7,000 years ago. Man began raising and confining animals that were the natural prey of wolves, making the wolf's hunt easier but creating a world of animosity between man and beast. 9. The creamy white coat of the Artic wolf is an obvious advantage for an animal living and hunting in an area-the Canadian Artic and the north coast of Greenland-that remains snow-covered for most of the year. 10. Hunger can actually enhance the wolf's sense of smell. If the wind is blowing in the right direction, wolves can smell prey from up to one and a half miles away.